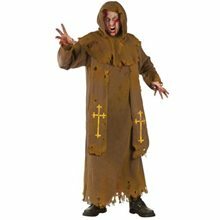 Zombie Monk Adult Costume.Includes: Tattered robe, shoulder stole, and hood with collar.Available Size: One Size Fits Most Adult. 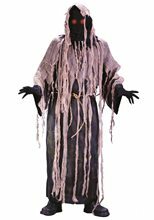 *Pants and Shoes Not Included.The Halloween spooktacular guests will be quite disturbed when he arrives in this Zombie Monk Adult Costume! Is it a "brother" or is it a brain-hungry Zombie? 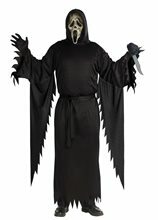 This men's costume includes shoulder stole, hood with collar, and robe. 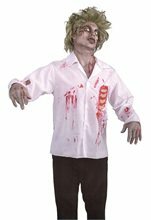 The 3pc Hand-washable Zombie Monk Adult Costume excludes the fake blood, boots, and make-up. Zombie Prom Queen Adult.Includes: Zombie prom dress, glovelettes, sash, and tiara. Available Size: Womens - Medium (8-10), Womens - Large (12-14). (See Size Chart For More Information) *Makeup, Shoes and Necklace Not Included. Accessories Sold Separately.Features zombie prom dress, glovelettes, sash, and tiara. Shoes, makeup and necklace not included. Available in women sizes medium and large. 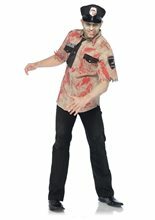 Deputy Dead Adult Costume; Deputy Dead Adult Costume Includes: One bloody tattered uniform shirt, tie and matching cop hat. Available Size: Mens - Medium/Large, Mens - XLarge. (See Size Chart For More Information) *Shoes Not Included. Accessories Sold Separately. Deputy Dead includes bloody tattered uniform shirt, tie and matching cop hat. 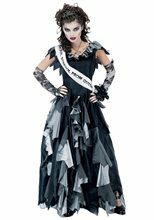 Putrid Prom Queen Adult Costume.Includes: One bloody tattered prom dress, Miss Living Dead sash and zombie crown. Available Size: Womens - Small/Medium (4-8), Womens - Medium/Large (10-14). (See Size Chart For More Information) *Gloves, Blood, Wig, Makeup, Stockings and Shoes Not Included. Accessories Sold Separately. Putrid Prom Queen includes bloody tattered prom dress, Miss Living Dead sash and zombie crown.